An appliance or piece of kitchenware that typically accomplishes the task of brewing the popular drink produced from ground cocoa beans. Made to operate with or without electricity, Coffee Makers are available in a variety of different models, some brewing only coffee while others are built as multipurpose brewers with multiple functions. The multipurpose coffee makers not only brew traditional coffee, but may also be built to brew espresso coffee, lattes, cappuccino, and other similar drinks. Single purpose coffeemakers may consist only of stovetop pots, brewing glassware, such as a French Coffee Press, or a fully electric makers with brewing stations for single cups or a pot. Stovetop pots for making coffee or tea only are configured with a perculator and drip basket that fits into the pot so the coffee grounds can be held in the basket while the water in the bottom of the pot is heated, forced up the percolating tube into the basket, and then allowed to filter through the grounds as it drips back to the bottom of the pot. This type of coffeemaker may also be referred to as a stovetop drip coffeemaker. Similarly, stovetop coffeemakers can be purchased for making cappuccino, latte or espresso coffee. Water is placed in the lower section of the coffeemaker and the ground coffee is added to filter basket. A pitcher situated at the top can be filled with milk so as the water is heated, the pressure of the steam not only brews the espresso but also mixes or infuses the beverage with eitehr frothed or steamed milk. 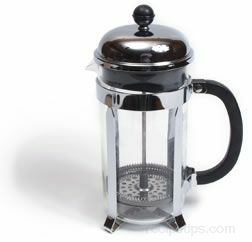 Brewing glassware such as a French Coffee Press are built to hold grounds in the bottom of the container. Hot or boiling water is added to the container holding the grounds, allowing the grounds to rise up toward the top of the water. Unlike a drip coffeemaker with a purcolator, the plunger mechanism (the Press) is manually pushed downward so the grounds are slowly moved through the water to make the coffee and then are held in place at the bottom of the glassware container so only the rich coffee beverage can be poured. Single purpose coffeemakers that brew a single cup or a pot of coffee are common for those desiring only tea or coffee without other beverage options. Single cup brewers are best for making individual servings quickly and easily with a mininum of effort. Disposable packets of premeasured amounts of coffee or tea can be added to the brewing basket as well as fresh coffee grounds. Most often, single cup coffeemakers have dial settings that allow for variations in water volume for smaller or larger cup sizes. Since there are many different models with numerous features, before a purchase decision is made it is always best to consider the types of beverages desired and the features that are of the most value for ordinary daily use. Coffeemakers that simply make single cups of coffee to machines that perform a wide variety of functions, each has its purpose and will provide years of good use when properly maintained.